Christine here. Just back last night from the “New England Braids” braid in, in Methuen, Massachusetts. I spent a few days with my co-authors afterward in Boston, and then drove home (11 hours, ugh) last night. 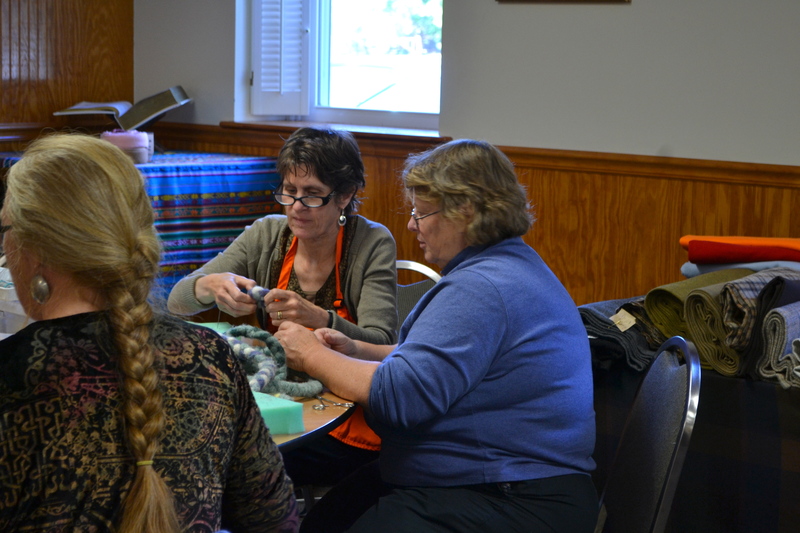 Some of the highlights of the braid in — other than the “family reunion” feeling of seeing all of my braiding girlfriends again, which is the best thing — were the Wild Fabric Challenge and Show and Tell. Somehow Raye Wood managed to work a strip tease into the event, which was absolutely hysterical (and not particularly skin-revealing, for anyone who might actually be concerned about that). 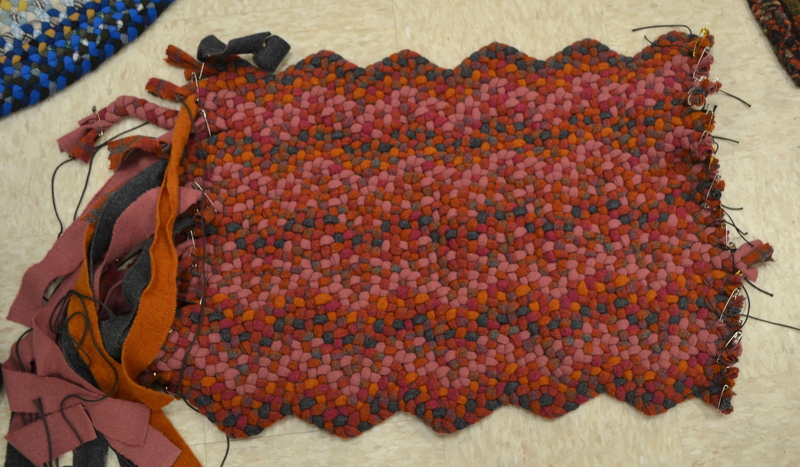 Carol Rizzo’s Zigzag Strip rug, in progress; this rug was part of the “Wild Fabric Challenge” of using an orange & pink plaid wool fabric. I continue to be absolutely amazed at the things that everyone comes up with. You can learn something from everyone there — interesting color choices, new techniques, a new way of doing things or combining shapes. Just amazing talent! 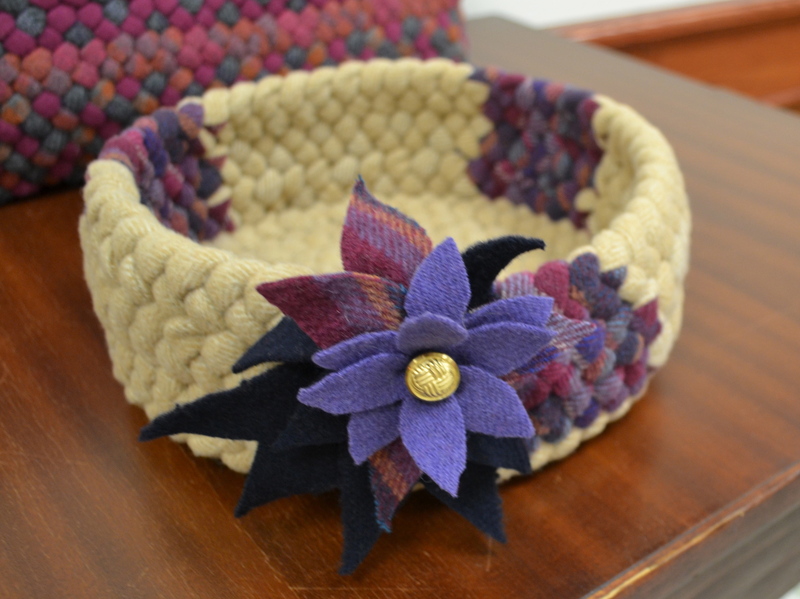 Another pretty Show and Tell was this basket by Peggyann Watts. Notice the pretty flower on the outside? 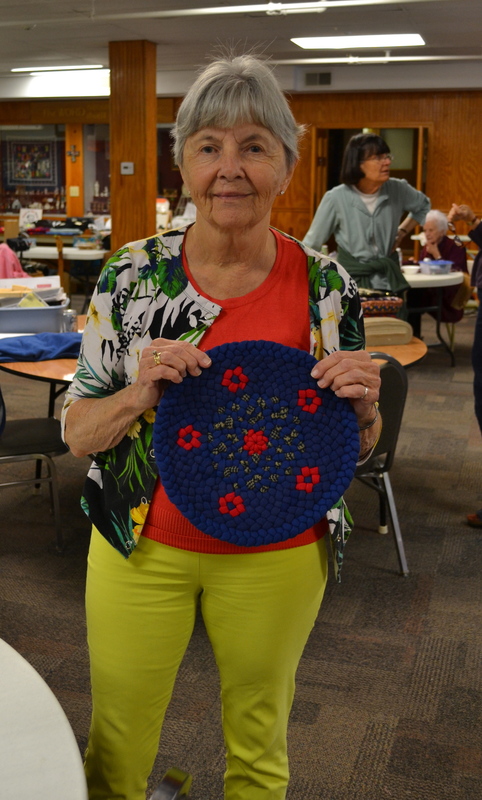 I’m hoping that she’ll teach us all how to make several different cut felt flowers as a class at the spring braid in, in Bethlehem, PA.
Dianne Tobias’ basket (see below) mimicked the plaid of the challenge fabric in the hooked basket bottom, then had braided sides with a fancy ruffle at the top. 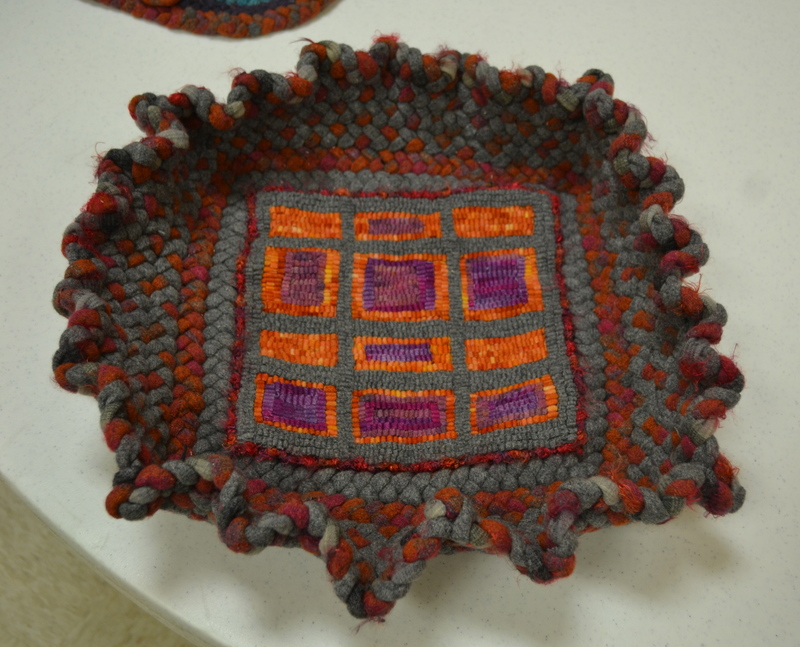 Our friend Kris McDermet also made a hooked-bottom basket that simulated the plaid in the design! Great minds think alike. 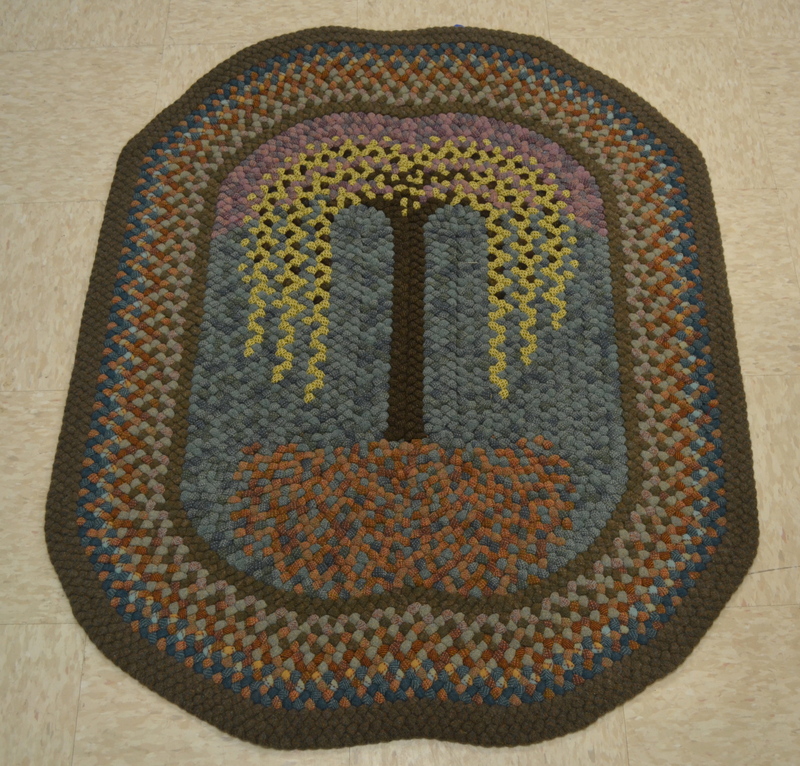 Another rug that was very innovative was Delsie Hoyt’s weeping tree. I didn’t catch the name of the rug. This is — I think — the second rug I’ve seen of hers that uses two ovals in the center in order to create the lovely tree design, and I think it’s just beautiful. A really interesting innovation in style. I was working on a braided vest for the fabric challenge and didn’t manage to finish, but… maybe by the spring. I just love going to braid ins. What a fun time and what great people!